Our Blue Mountains townships and villages perch on the ridges above some of the most biologically diverse, fragile and beautiful natural vegetation in the world. People have dramatically altered our natural environment, and all human activities carried out in our townships affect our downslope bushland, our World Heritage National Park, and our streams and rivers. Stormwater rushes off all our hard surfaces — roads, roofs, car parks, garages, factories and driveways — carrying with it the pollutants and detritus of everyday life. These include oils and chemicals, rubbish and organic litter, soil from cleared land, fertilisers, pesticides, herbicides, sewage from overflows, weed seeds and animal faeces. This stormwater cocktail enters the bush, erodes watercourses, silts creeks, and changes the nutrient levels of the soil. Most native plants are adapted to low nutrient conditions. High nutrient levels may impede their growth or cause them to die. Moist, fertile soil favours the growth of weeds and invasive species that replace native plants. Silt-laden stormwater carries weeds into the bush. Many ornamental plants have escaped gardens to become bush invaders. Weeds can also do a slow creep into the bush by growing vegetatively. All of the weeds on this web site are aggressive competitors with our unique native plant species. Weeds destroy the habitat of our unique indigenous fauna. 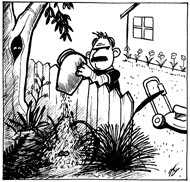 Dumping of garden waste can introduce weeds into bushland through seeds, bulbs and corms or plant fragments in prunings, grass cuttings, leaf litter or soil. 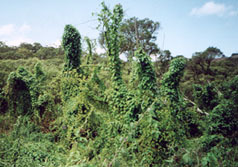 Weeds may quickly grow and invade the bush. Dumping is illegal and incurs penalties. Removing of dumped material costs every rate payer. Any kind of disturbance of the original soil conditions leads to weed invasion. Disturbance such as clearing, excavating, slashing, mowing or burning creates opportunities for weed invasion through increased light levels. Weeds are often prolific along roadsides, bushland edges, watercourses and tracks. Foot, vehicle and animal traffic through the bush can cause erosion and compaction of soil, and may introduce weed seeds. Weeds like Morning Glory dominate and replace native plants. 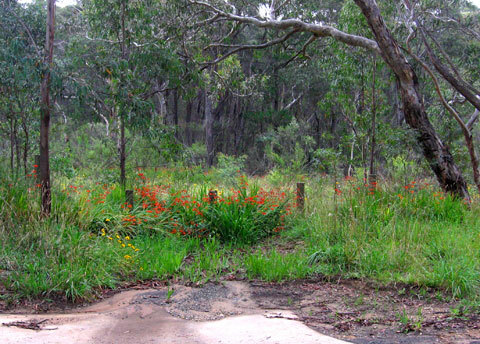 Weeds are plants free of their natural predators which thrive in disturbed bushland conditions. They compete vigorously with native plant species and frequently dominate and replace them. Weeds degrade and destroy the habitat of native fauna. They restrict animal and human access to tracks, creeks and waterholes. They reduce local biodiversity and can permanently change ecosystems. Early detection and eradication of weed invasion is the most effective treatment. Ask Council’s Bushcare Section for this free booklet by calling 4780 5528, or just download the PDF.